Justify the importance of solving ediscovery. 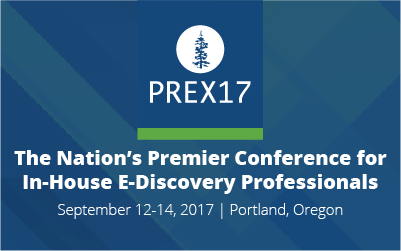 If there’s one smart way to improve your ediscovery success, it’s attending PREX17, the nation’s premier conference for in-house ediscovery professionals. Don’t miss your opportunity! This year’s PREX will not only be bigger, it will offer bolder content and better access to networking with the brightest minds in ediscovery. World renowned journalist Glenn Greenwald, who won the Pulitzer Prize for his work covering Edward Snowden’s CIA revelations, is the featured keynote speaker. His presentation will explore the layer between law and technology in today’s complicated landscape. After hearing Glenn’s talk, you’ll be running back to the office to establish a “culture of compliance” across your company. You’ll also meet leading jurists, lawyers and in­-house practitioners who will give direction on case law, FRCP compliance and trends that most impact corporate legal teams. Attending PREX can help you learn today’s best practices and build more sustainable e­discovery processes. Whether your ediscovery goal is to cut costs, protect data or optimize legal compliance, PREX answers your business needs. You’ll find practical ways to improve litigation response and streamline preservation and collection workflows. 94% of attendees surveyed said PREX was a great investment of time, money and education, with sessions covering concrete tips to boost ediscovery success. Need further assistance justifying why you should attend PREX? Visit the ‘make the case’ section on prex17.com. I hope this information provides you with the support you need to join us in September!